20160404 - Up in the am and in to work. Had a long day of getting things done and lined up for the rest of the week. Snowing today so all games cancelled... Home a bit late, got something to eat and then headed to Scouts with D&J. D was fired from his Quartermaster position with the Scouts because he hasn't been to meetings due to baseball weightlifting. 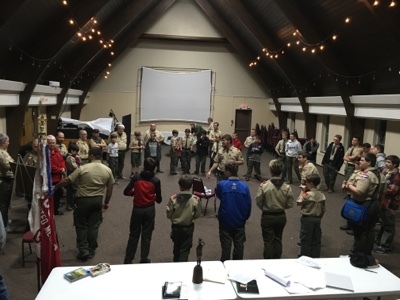 I got some merit badge info and hung out until the end of the meeting, it is amazing how big the circle has gotten. D ran me to the gas station after the meeting and then we headed home for some ice cream.